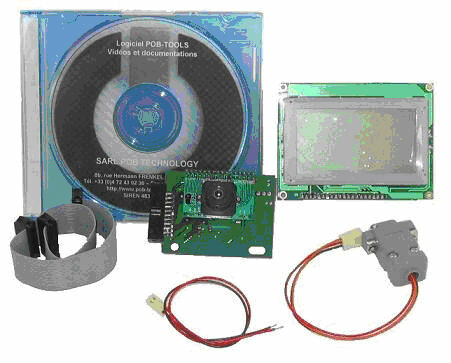 The POB-Pack 1 is a pack including an intelligent color camera and a graphical screen. Given a colored view to your robot and a screen for interactivity. Development in C, Java or Basic. o 1 POB-Eye : programmable color camera module (C,Java, Basic). o 1 POB-LCD128 : Black and white graphical screen (128x64 pixels). o 1 CD-Rom: Full SDK Software (compilers, POB-Bitmap, POB-Pattern...). o 1 Nap Cable, 1 Serial Cable , 1 Power Cable.